Last week my husband came home after two months away. The joyous homecoming, with an anticipated 3-day holiday weekend, was short-lived however, as less than 48 hours later the navy sent him back out again to avoid a “typhoon.” Not all the ships were sent out from Yokosuka, Rob just got lucky. So Chip and I were left alone to face the “typhoon.” I put “typhoon” in quotation marks because I was not impressed. Despite dire warnings issued by the base weather service, the only damage we sustained was Rob’s bike blowing over. Other than that, it was just cold rain as usual. There was no way I was staying in the house with a 1-year-old all weekend, “typhoon” or not. I needed some cheering up, and as a long walk on the beach was out of the question, some comfort food was in order. As Japan has no Museum of Macaroni and Cheese or Museum of Bread Pudding, Chip and I went to the next best thing: the Ramen Museum in Yokohama. Yes, a whole museum devoted to noodles! The Ramen Museum. And "typhoon." 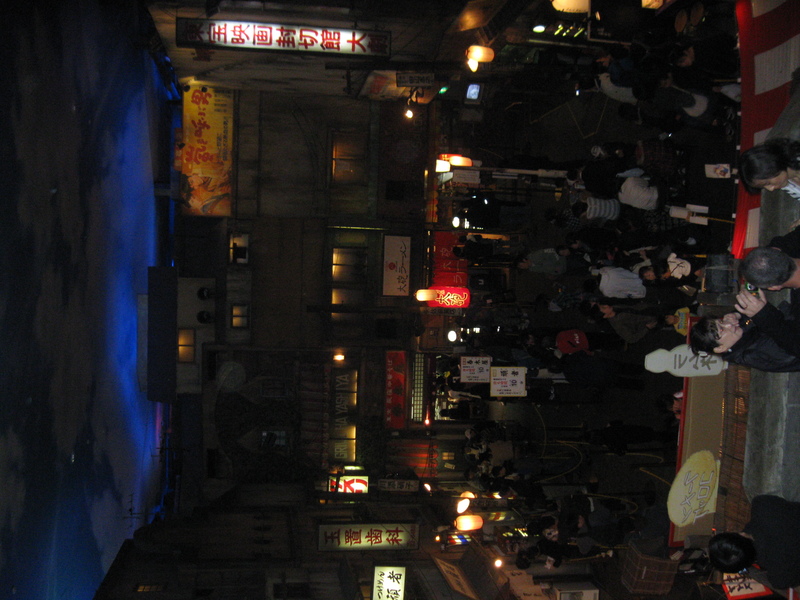 Admission was only 300 yen but, as the guide warned me, all adult visitors are expected to buy a large bowl of noodles. No problem. I had no idea what to expect, but Tokyo in a basement was not it. There was a whole neighborhood of Tokyo circa 1958 reproduced underground. Behold the City of Noodles. Nostalgia always does make me hungry. It must have made the citizens of this neighborhood particularly hungry, too, because every shop in it was a ramen restaurant. I certainly hope the denizens of this quarter never had to buy bread, or tea, or clothing, or a broom or something like that. 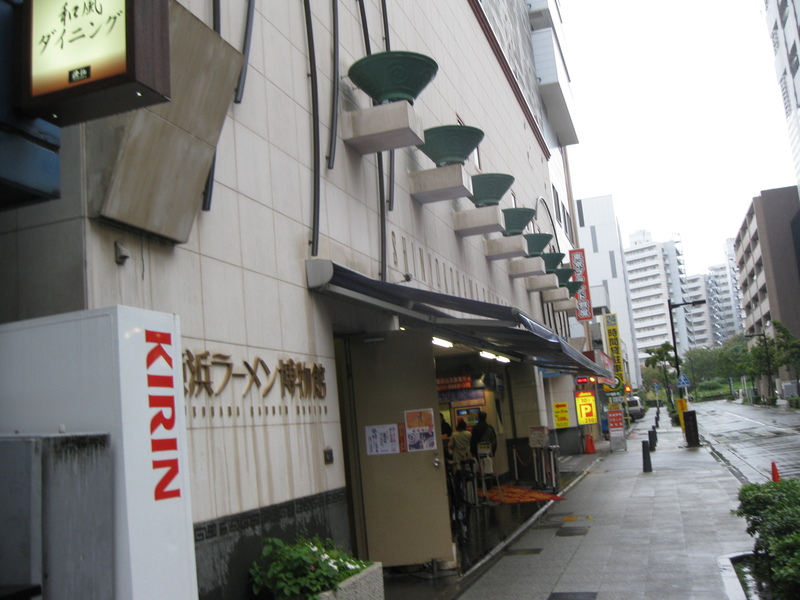 Each shop served ramen from a different region of Japan. I wish I could read; all the descriptions were in Japanese. 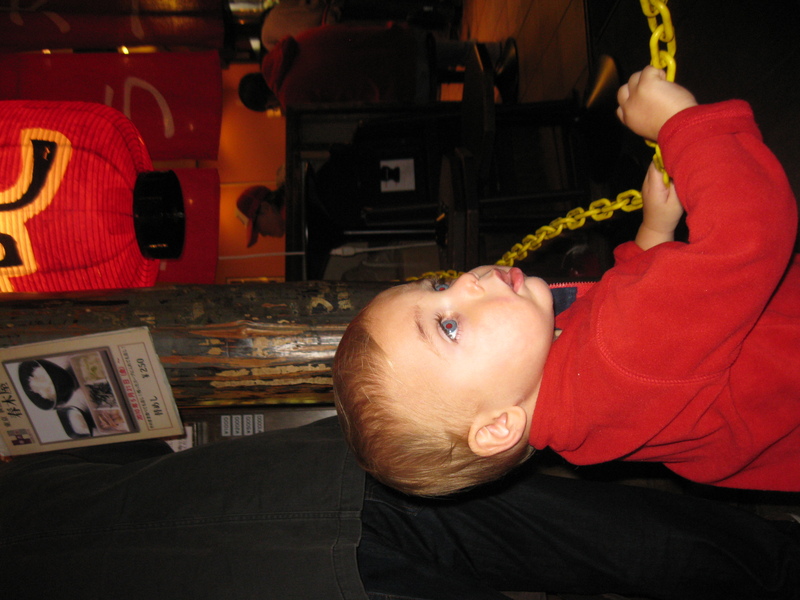 With that obstacle, not to mention Chip doing his best to get lost in the good old days, I simply looked for a restaurant that didn’t have a line and did have a high chair, which are probably not the best criteria for really choosing your ramen. Anyway, bingo, we found one right on the neighborhood square. All the ordering was automated; I recognized the word ramen, 700 yen, on the little ticket dispenser and managed to get that. To my delight, I also recognized gyoza which are these little pan-fried dumplings that I love. Chip and I got to sit at the counter and watch them make the ramen, which is fun. The ramen itself was interesting; my best guess is that it was “taiho” ramen from Fukuoka in southern Japan. Wherever it was from certainly reveres the pig. The broth was very pork-y and there were thin slices of pork on top. The noodles were also very thin. It was good, but I like my Hayama miso ramen at my neighborhood noodle shop much better. The gyoza were small and wonderful, and I had to fight Chip for them. I wish I could have tried more (I have a pretty bottomless capacity for ramen), but Chip-chan was ready to go back to the 21st century. He had a rather spectacular meltdown on the train ride home, but time travel will do that to you. And now maybe my husband will come home again, and we will get to have a re-reunion. If not, I always have the noodle shop just down the street. Boo. Hiss. I do not like the tale of the shortened holiday. Not one bit. But I’m glad there were noodles….